Anyone who has lived through a hurricane can tell you these storms are no joke. Before accurate tracking, hurricanes had the potential to wipe out entire cities, such as the Labor Day hurricane in Key West in 1935. With better equipment, lives and property can be saved, although widespread destruction and lasting suffering is still common. Recently, Hurricanes Harvey in Houston, Irma in Florida, and Jose and Maria in the Caribbean islands have highlighted the awesome, and often uncontrollable, power of nature. Weather organizations such as NASA use high tech satellites and other instruments to capture images and predict paths of hurricanes. Although a full hurricane can span hundreds of miles across, the most intense winds form about a hundred miles from the center. 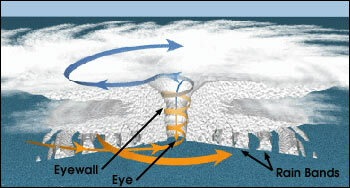 Scientists divide a mature hurricane into three main parts: the eye, the eyewall, and the outer region or rain bands. If you have ever heard the phrase “eye of the storm”, you have heard reference to the center of an actual hurricane. The eye represents the central region, where very little clouds, wind, or rain occurs. In contrast, the area surrounding the eye, called the eyewall, is extremely violent, producing the heaviest rain and strongest surface winds. Hurricanes form in the Atlantic ocean, starting near the African coast at the equator. 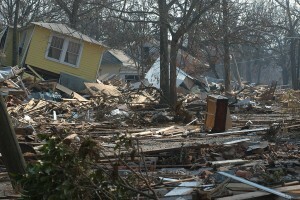 Similar storms such as cyclones and typhoons can form in other parts of the world, although only Atlantic storms are officially called “hurricanes”. The African coast contains warm, moist waters needed to fuel the growing storm through a cycle of air warming, rising, and cooling. At the start, warm, moist air rises from the tropical waters, creating an area of low pressure. As this air rises, cooler air from surrounding high pressure areas starts to fill in the gap left by the rising air. The new air becomes warmer, rises, and the cycle continues. Why does all this rising tropical air matter? As the air rises, it cools and forms clouds through a process called condensation. Now, the system spins and grows, fed by the rising air in tropical waters. As the storm rotates faster and faster, prompted by the rising air, the eye forms, and the storm eventually becomes massive enough to be moved through the ocean. Thankfully, the swirling masses of wind and clouds do not get to go wherever they want. Scientists predict their path to some extent thanks to the steering of global wind patterns. The global winds act as tracks. In the northern hemisphere, easterly trade winds push the storms in what is initially an east to west pattern. 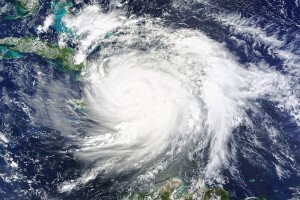 Other wind patterns such as high and low pressure systems cause hurricanes to veer from their initial east to west track, often pushing them up the cost of the United States. What do scientists say about hurricanes and global warming? Immediately after Hurricane Harvey in Texas, National Geographic wrote an extensive piece on this particular storm’s relation to climate change. Kevin Trenberth, a senior scientist at the National Center for Atmospheric Research in Colorado reported that “In general, the way to think about it is: climate change has changed the environment that everything is happening in…When you add in the climate’s natural variability and then the right conditions come along, you can get a storm which is stronger than you might otherwise have expected.” What Kevin means is that global warming or no global warming, some storms are naturally going to be stronger than others. 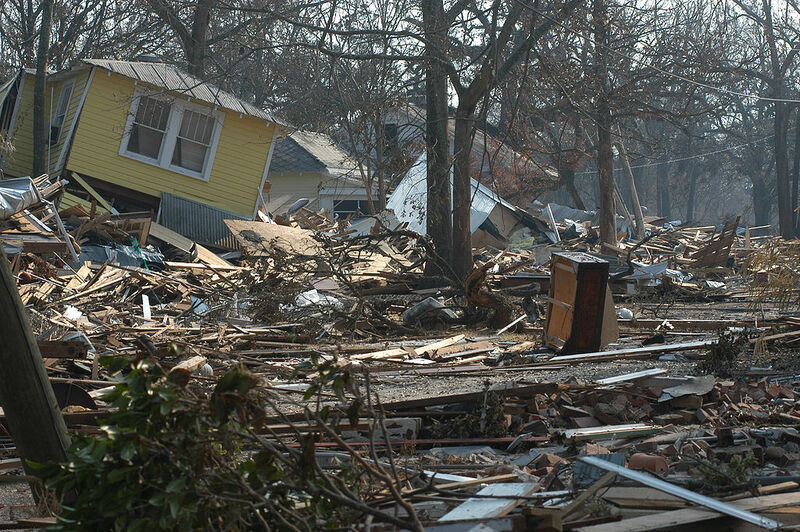 However, when the climate changes so that the environment is better suited to fuel the storms, the right conditions for extremely powerful weather events to occur becomes more likely. It is important to note that scientists do not blame global warming for single weather events, but rather relate it to general trends and increase in storm severity. Warmer waters add more fuel to the storms, resulting in stronger storms within shorter amounts of time. Additionally, warmer water increases the amount of air rising into these storms. More warm air means more clouds and higher rainfall. Although the exact correlation between global warming and increased hurricane number and intensity in the Atlantic Ocean is still being studied, most climate scientists agree that warmer waters are fueling the fury and making conditions ripe for more powerful storms.